I agree completely with Naomi Norbez. I just have one question. What the hell is a wooden block that you hit to make music? Dude, I finished music school and I have no idea what are you talking about. Thanks for the feedback. There's a hint sheet here if you want the answer to that one. oooooh! I get it now! But to be honest it was worded in a way that made it really hard to figure out what was going on. That extra level was easy though :) Nice game. Definitely agree. That was way more obtuse than I meant it. I'll have to redo it after the jam is finished. Thanks again! Interesting concept for a game, but the instructions although simple doesn't seem to convey the full meaning sometimes. Couldn't get through level 9. Thanks for the feedback. There's a hint sheet here if you want to give level 9 another shot. I don't get what you are supposed to do in level 9. I don't think The mechanic about bad words adds much. Nor does the timer. This is a fun little game, and I like the idea of it; trying to follow such simple instructions. The "bad word" mechanic I don't like as much though. The game's instructions are not as clear as they could be, though? For the first level I thought the slider was the circle-thing, so was confused when I got "job not done". And level 2 really amped up the amount of tasks and difficulty (the spiral one is especially confusing--I understand the instruction at all, and just wrapped it bit by bit until the sound played). Things are explained in a way that's more confusing than it is simple, and I'm not sure if that was intentional or not. I eventually set the game to easy and had a much better time (thanks for having an easy mode! ), but a walkthrough would probably help too. I also think it's a pretty mean dig at the original xkcd comic. 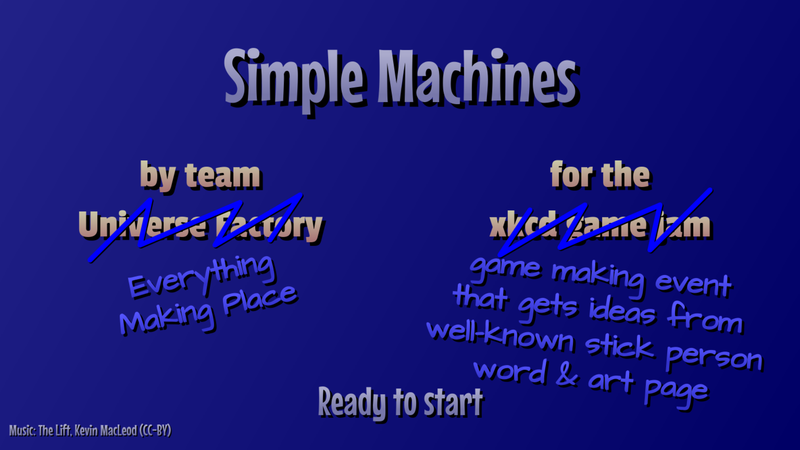 While Simple Machines does make a fair point (that complex words are important, and simple words can only hinder understanding if used incorrectly), Thing Explainer, by using simple words, tries to be an accessible way to view complex things, and shows how simple words can help understanding. 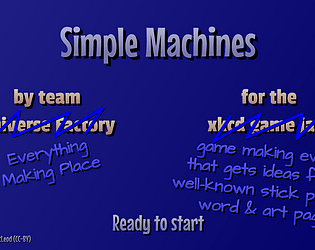 Simple Machines takes the complete opposite approach to this, which I suppose was your point. This was a pretty fun game, and surprisingly complex for a game made in a weekend. Definitely worth playing. That damned letter. I'll probably realize what it is tomorrow. If so, it would totally be worth it to play again.